Combined with the clothes on your back you now have two full outfits. If your luggage is MIA you can wear one outfit while you wash the other in the sink with your Woolite packet and let it dry! If there are 3 people traveling, make sure that there are roughly equal amounts for each person in each bag. That way if one bag doesn’t show, no one is left out. Packing our bags is sort of like dealing cards... I put the bags that we are taking on the floor and then “deal” each person's clothing equally into each bag. 4 shirts in this bag, 4 shirts in the other……2 shorts in one bag, 2 shorts in the other….and so on. I don’t claim to be a fashion plate by any stretch, but I do try to pack items that are of a similar color palate. Black based, brown, neutral, etc. Take items that are interchangeable, that way you don’t clutter your bag with duplicate items: black AND brown shoes, black AND brown belts, etc. Pack from high priority to lower. Sure it will be nice to have those drink containers for your cocktails and squirt guns to play with…..if they fit. But items such as toiletries, first aid, and sunscreen are a must. Get them in the bag early! Place odd shaped or large items in the bottom of the bag... tripods, sunscreen, toys, toiletries, etc.. Then fill in around these items with items that don't have to be packed perfectly like bathing suits, socks, underwear, etc. This creates a flat surface in the center of the bag to put your nicest clothes and most fragile items. If you have a large shoes, etc. fill them with smaller items like socks, underwear, etc. I always put water shoes, flip flops, sandals in the outer zipper pocket of the suitcase (rubber soles out)…..they are pretty durable and help create a protective shell over the top of your soft sided luggage. Save a few items (athletic shirts, shorts, sleeping clothes, etc.) to tuck all the way over the top of the bag prior to zipping it closed, this helps keep everything in place. We use the Eagle Creek – Pack-it Specter Cube Set. These ultralight packing organizers allow you to not only compress your garments but keep them organized as well. They come in three sizes: cube, half cube, and quarter cube and you will be amazed how much space you can save simply by using this product. Now don’t get the wrong idea here, these aren’t a spin off of those late night infomercials where you put everything in a plastic bag and then remove all the air with a vacuum cleaner. The Pack-it cubes simply allow you to compress your clothing a bit without wrinkling. Just think about a standard zip up fleece and the amount of space it takes up, fold it in half and then press down on it firmly……half the thickness right? This is the concept behind the Eagle Creek Pack-it cubes and you will be amazed at how much space the save you. The other reason we love using the Eagle Creek – Pack-it Specter Cube Set, especially on multiple location trips, is for the organizational aspect. With 3 people and several locations, packing and unpacking can become a real chore, so each person has their own set, in their own color. This makes it very easy once you get to your destination. Simply unpack all of the cubes by color and that person’s full wardrobe is all in one place……no more digging through a packed suitcase trying to find what you are looking for, all the while wrinkling everyone else’s stuff!! *Bonus* - What’s in my carry on bag! It would be easier to list what isn’t in my carry on! As someone who loves travel AND photography, my carry on bag and contents are of the utmost importance when flying. 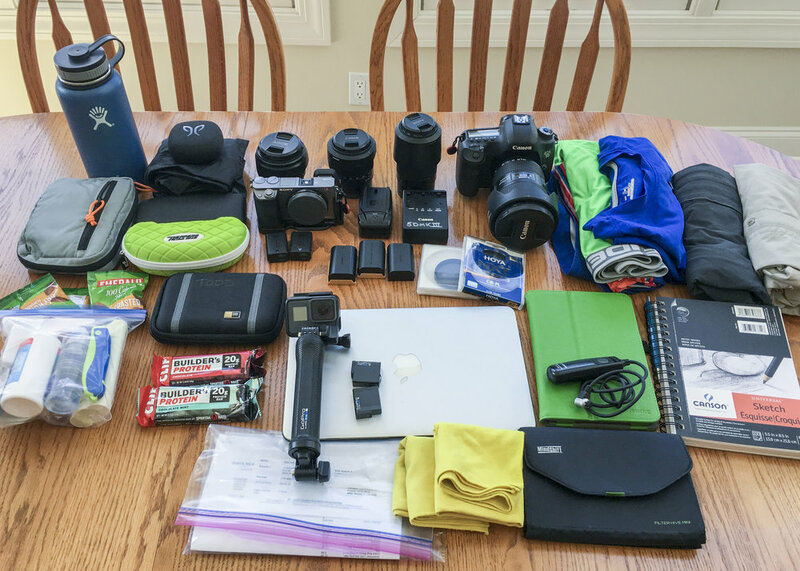 There’s no way I going to fly somewhere new and cool without the right photo gear, but I also need follow my own rules of packing a full change of clothes in my carry on….and then there are the electronics!! As you may imagine packing my carry on bag is the most important and the most nerve racking part of packing for me! Choosing the right bag is VERY important!! (I literally have a pile of quality/ big name bags in our basement that just don’t fit the bill.) Just when I felt like I had tried them all (and Carrie was beginning to worry I had somewhat of a bag “issue”), I tried the Backlight 26L from Mindshift Gear. I have been used this bag for a couple of years now and love it!! It has been “the right bag” for a 7 week trip around the Great Lakes, a 10 day/ 3 location trip to Costa Rica, road trips to Florida, Georgia and South Carolina, water falling in West Virginia…just to name a few! 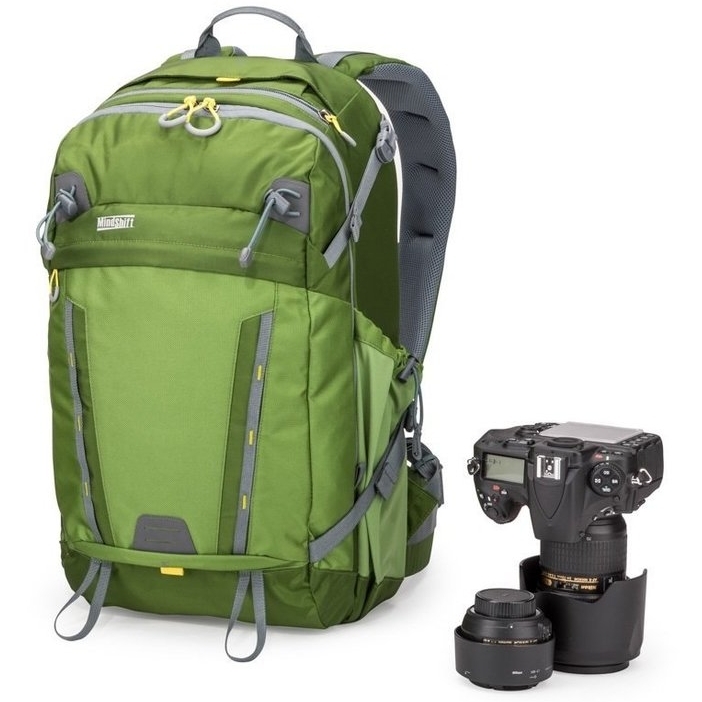 It carries the perfect combination of camera gear, electronics, travel essentials, and creature comfort items. • Leave a comment below with any questions and share your experiences so others can learn from you! • Share this with other adventurers… just click share below. • Are you part of the community? If not, you’re missing out on valuable information that is only shared in our regular emails. Click here to sign up! Newer PostA Perfect Rocky Mountain Retreat!